Got back to my karma bhoomi, Chennai this morning. The best part of the drive is naturally beautiful landscapes and thanks to the Ex-PM Vajpayee, this road is a part of Golden Quadrilateral and worth the toll (4 in total) that we pay. I more than make this up in terms of time saved and fuel burnt too (4 1/2 hours drive with a loo break of about 10 minutes added in). Wondering why is it that I tire easier while returing from than while driving to Bangalore. Hey! no one need to explain the reasons. But a big emptiness is a result each time I return back. Especially the visits which includes lot of visits to Ashram. It was Christmas Party(an excuse for us to celebrate a birthday – Thanks Jesus!) very unlike the previous one of very many years. Gurudev was scheduled to be in The Ashram to celebrate Christmas with all of us and the festive mood set in early 25th Morning from the special breakfast which was indicative of things to come during the day. 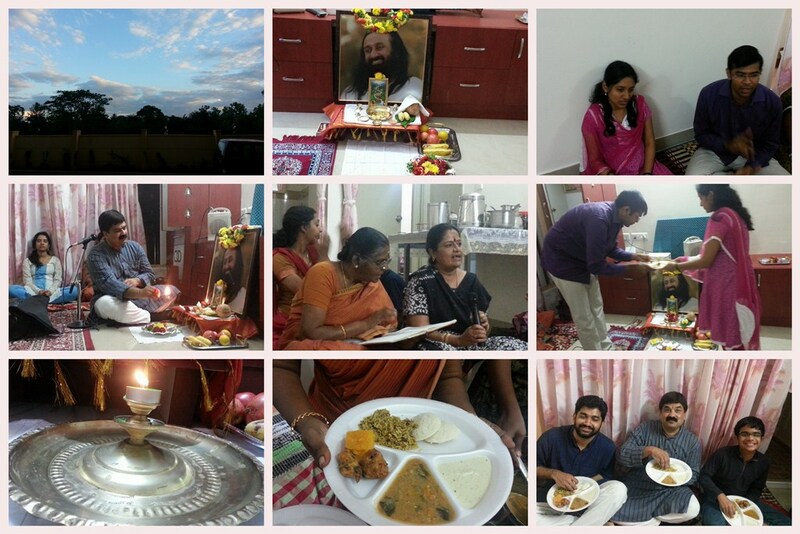 Yummm….delicious breakfast and then eagerly awaited Arrival of our beloved Guruji. The whole place was packed and it was a riot of colors predominantly red (Santa Caps, Red Jackets etc) and of course what is Christmas without that fat, jolly good Santa Claus. Art-Excel, YES, YES2 and YES+ course participants boys and girls brought in the required gaiety and mood which was nothing but JOLLY all the way. As an icing to this festive cake, lot of International Courses’ participants started landing in Ashram giving this Christmas in Ashram a truly International Flavour. The moment everyone eagerly awaited for weeks arrived and HE arrived! The air in Ashram resounded with the Jai Gurudev!!! and it was a treat to the ears. With his characteristic swaying and waving, he got down from the car and walked through – for everyone there it was the best Christmas Gift – proximity and presence of the Master. 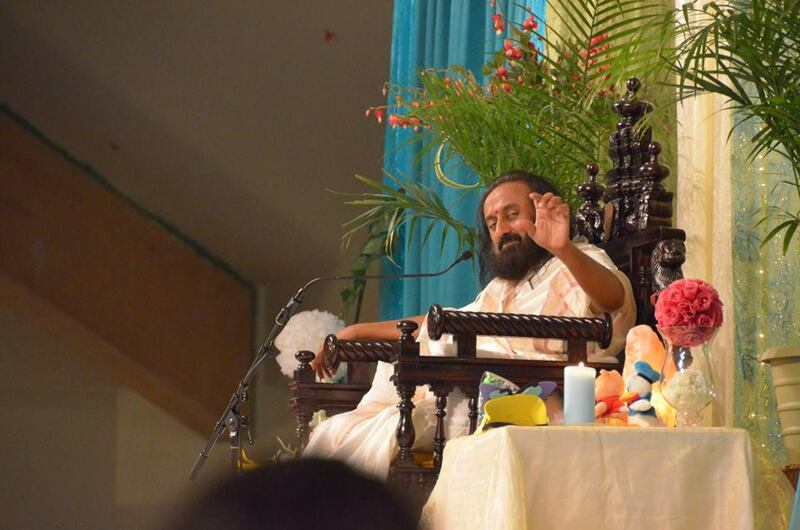 Gurudev then urged everyone to leave and have their lunch which was a great treat again. The Christmas tree in front of Kashyapa was tastefully decorated with lights, festoons, bells, stars and gifts 😉 Amphitheatre decorated even better (in fact acknowledged by Guruji during the Satsang with a congratulatory message to the volunteer team who decorated the amphitheatre). 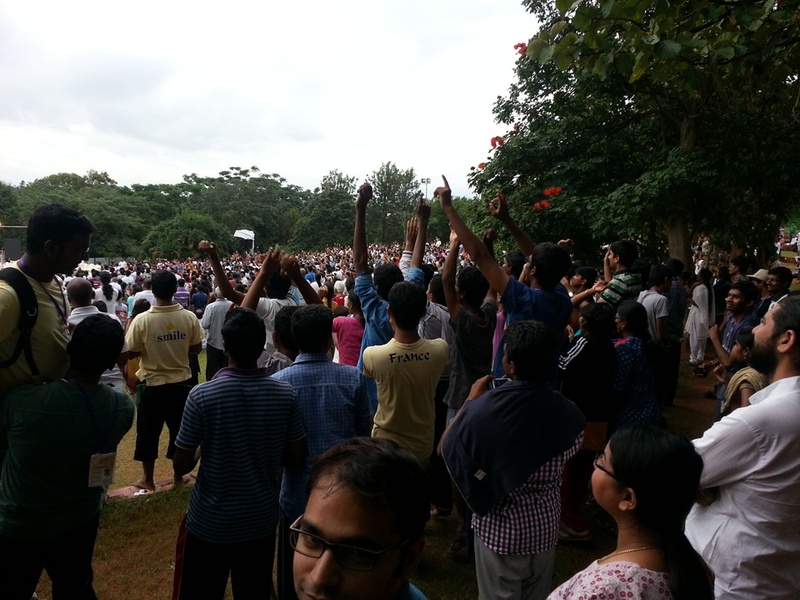 The amphitheatre was getting filled up by the moment and by the time the Satsang got underway, the place was packed. The evening began with a nice rendition of Gowri Nandana, followed by Guru Narayana by Sahil. Next came Har Har Bole Shankara and in the middle of the song, in walked Guruji to the electrifying applause of the whole crowd. It was a sight to behold, an unforgettable Christmas for anyone present there in Ashram. He joined rendering Jai Jai Jai Devi Jagadamba. 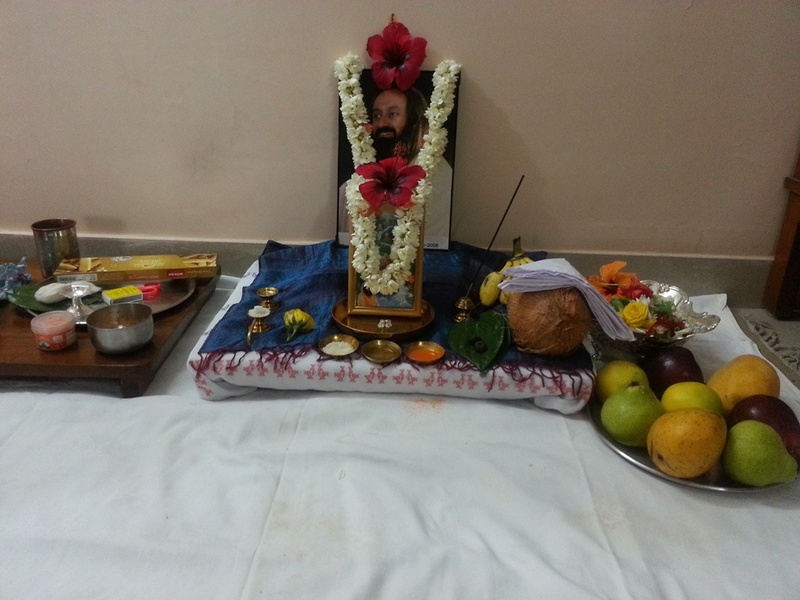 Subsequently on popular demand, Guruji rendered Madhava Madhusudhana, Yadava Yadunandana. It is amazing, indescribable feeling whenever HE sings this song. This was followed by a percussion performance by students of our Ayurveda college. This number that they performed had earlier won them a 2nd prize in the University cultural fete. It was a lovely performance which deserved the prize (maybe the first). It was wisdom time and in response to a question, Guruji says, Celebration happens when the mind stops chattering and stops working. Nothing is there to understand about Celebration. Life should be like a Christmas tree, full of lights and gifts for everybody and green for ever. HOW I wished this evening never ended. 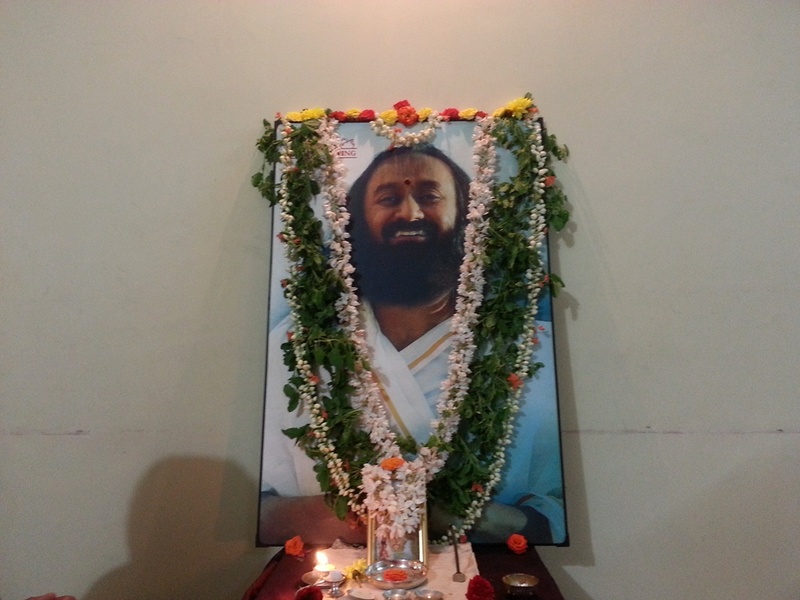 The saving grace was that we have a New Year Eve Celebrations with Guruji to look forward to. It was a another evening – as usual with all the gaiety and merriment that comes to be associated with any New Year Eve Celebrations. 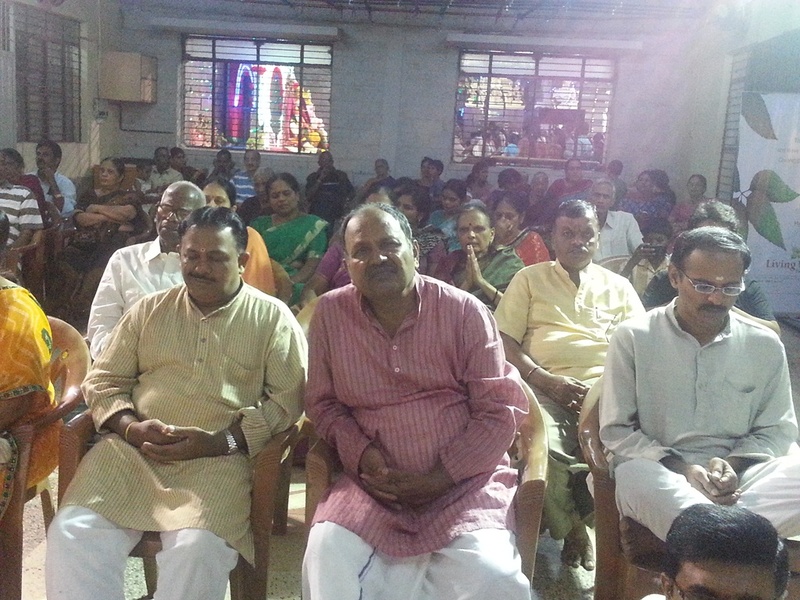 Spirits of non-liquid type flowed all over the place, reverberating with melodious strains of Bhajans. The fading lights never dimished the brightness surrounding the amphitheatre for the dais was filled with a galaxy of stars – led by Guruji along with stars from the Kannada Cine Industry, erstwhile Spin great, Cricketer BS Chandrashekar, HAL’s MD Mr. Saxena, AGM of SBM, Mr. Rao of Wipro who also bought the first ticket for Pranayam Dhyan Shibhir and Thiru Swamy from the ISKCON, Bangalore. 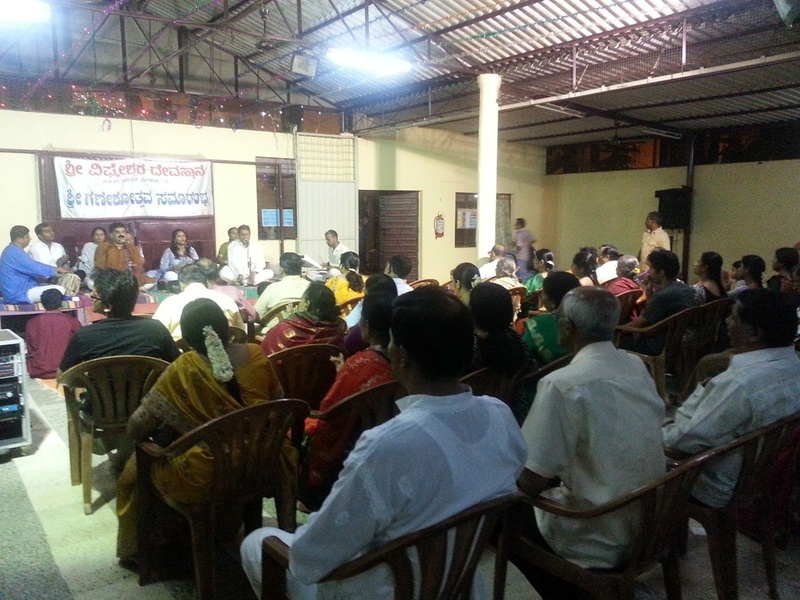 It was also a curtain raiser event for the Pranayam Dhyan Shibir scheduled to be held in Bengalooru starting from Feb 5th 2007. The curtain raiser event began with lighting of lamp (incidentally the lamp moved from the edge of the dais right to the place where dignitaries were seated upon HIS request). All the speakers emphasized the importance of Pranayam and Dhyan and the great work being done by Art of Living and Guruji. Thiruswamy of ISKCON, said, “Like how the lamp came to Guruji just as HE wished, the whole world today has come to HIM seeking HIS guidance. He commended relentless travel and efforts that Guruji puts in to spread the message of love and it was so visible in the Ashram” HE also recollected the characteristic composure of Guruji during SJC totally undaunted by the magnitude of the task. He also exhorted everyone to ensure that Bangalore PDS should be attended by not less than 1 Lakh people since it is not money nor title but the inner calm that brings happiness and this is possible only through the traditional spiritual pratices. 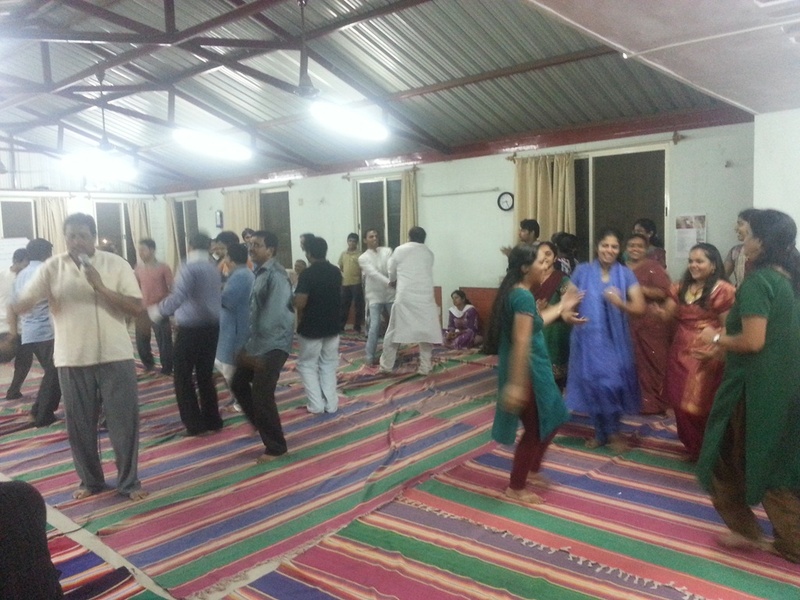 Then came the event of the evening – Guruji’s talk! He guided us through a meditation – linking it to the setting sun 3 Aum chants to bid a fond farewell to the the last sunset of the year and to welcome the Sun for the New Year. The next 10 minutes or so was pure bliss in meditation! and HE told all of us to retire and get ready to welcome the New Year at sunrise (making sure that sunrise time is not 8:00 AM 🙂 🙂 He stressed that as per Indian traditions, the day starts at sunrise and we dont have to wait till midnight to usher in the New Year. Accept both good and difficult times – learn from both good and difficult times that we went through during the previous year. Pray that we derive the Strength to face difficulties instead of wishing that there should not be any difficulties since we can learn a lot from difficulties too. We usually hold on to the difficult times in our minds instead of letting it pass after learning the lessons, just like the sugar cane which is sent to crushing unit – the juice (Knowledge) which needs to be held on to and the bagasse (difficulties) need to be dropped behind. He then asked us to question ourselves as to what we can do to the country, the world and to others, take a sankalpa for the New Year. A Bharatnatyam performance followed and it was felicitaion time thereafter. The evening ended with delicious prasad and it was time to bid Bon Voyage to our beloved Gurudev who is leaving to Bad Antogast, Germany late in the night before which HE had an appointment to keep in the city. While it was retiring time for us, for HIM the day just began! Wishing everyone a great New Year 2007 filled with joy and smiles. Check the photo and carefully observe the circled face. Yes! it is Vishnu (my son) in the bottom circle and his cousin Abhay on the upper one, eagerly waiting for a handshake from HIM! on the New Year Eve – a photograph from the Indian Express.